As I said earlier, Snyder knows Batman. Snyder has the voice of both Wayne and Batman down to a science. 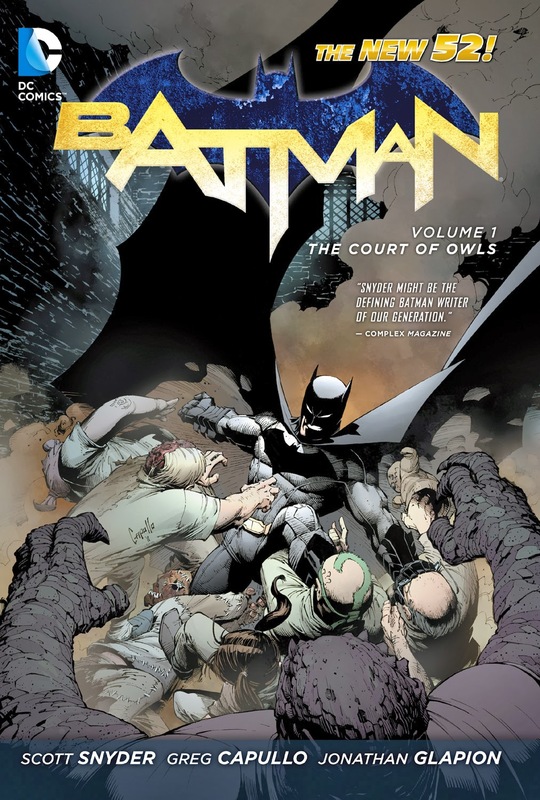 In Court of Owls, he manages to nail the recent, lighter characterization in Batman Incorporated while also incorporating the Batman of Hush, No Man’s Land, and Batman Year One. The detective aspect of Batman is also here because Snyder writes an incredible mystery. Pages are constantly turned when Batman discovers the DNA of a killer who has struck Gotham, which is revealed at the end of the first issue, but that’s only the start of it. 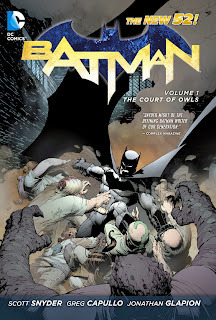 Clues start popping up as to the whys, hows, and whos of The Owls that have controlled Gotham City for so long, and it’s on par with any great mystery comic out there. As a single volume story, though, it doesn’t work for me. While the writing is certainly enough to get someone to absolutely love this comic, I’d be remiss if I didn’t talk about the comic’s other half composed by penciler Greg Capullo, inker Jonathan Glapion, and colorist FCO. First and foremost, whenever is group works together, they bring the best out of each other, which is evidenced in books like Haunt, but more so within the pages of Batman. They have a chemistry that makes the entire comic feel like something special just by looking at it, which it is. Capullo has a kinetic energy to his pencils that makes the still images jump off the pages with movement that is as exciting as it is clean and beautiful, while the colors of FCO enhance the comic’s beauty. Where Glapion’s talent comes in, however, is with his heavy inks that set the dark tone and mood that Snyder is crafting with The Owls. And the way these two work together sums up the pace and story of The Court of Owls, it’s an action/adventure thrill ride that also lends itself to deeper thought with a looming darkness that constantly feels like it is about to strike. The Wake was my exposure to Scott Snyder, and I must say, I was really happy with his writing and storytelling until issue six, which started the disappointing downward spiral into the dreadful read of the 10th and final issue of that run. I am very cautious with anything Snyder writes now... but based on this review, I may start a Batman adventure with Court of Owls. Thanks for the review.